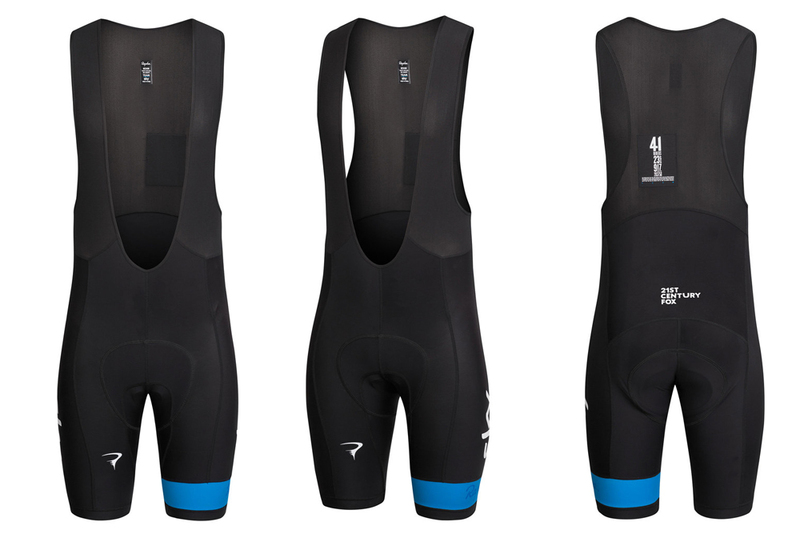 Rapha has released its line of 2015 Team Sky replica kit, including several jerseys and bib-shorts, which feature updated materials and a design tweaks for next season. As before, the ‘replica’ range is not exactly the same as the team’s actual kit – in Rapha parlance that range is the ‘Pro’ kit – instead, it is “re-thought, and adapted specifically to the needs of amateur riders”. The jersey is available in either black with a blue stripe on the left sleeve and down the back, or blue with white stripes. Both use the same breathable, wicking fabric with anti-bacterial treatment and have the traditional three pockets on the back. Price is £75 and sizes range from XS to XXL. The bib shorts are available in black only, and have a redesigned leg gripper. Rapha has used a Cytech pad, with a mesh fabric section above the waist at the back to aid ventilation. Rapha says that short has been “cut low at the front for answering calls of nature” – we can’t argue with the sensibility of that. Price is £100, with sizes running from XS to XXL. There’s also a new ‘Club Jersey’, which uses the white, blue and black colours of team Sky in a more traditional Rapha design. This doesn’t feature any Sky branding, but the team’s influence is apparent. This has a short zip, long length and three pockets at the rear that also feature a pump sleeve. Price is £100. Kids’ riding and supporter jerseys and a zipped leather training case are also presented in the range. For more information, pricing and online ordering go to the Team Sky section on the Rapha website.